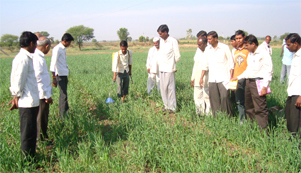 Extension Education in agriculture and allied fields is concerned with dissemination of agricultural technologies evolved by the university & ICAR Institutes to the doorsteps of the farmers to increase crop production on one hand and to bring the feedbacks to research system on the other hand. It also aims to transfer of knowledge and skill about agriculture and allied fields and build competence among the farmers and other clientele groups through various extension programmes. 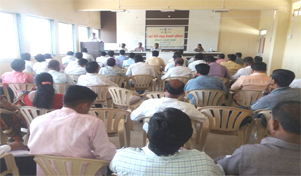 The Directorate of Extension Education is carrying out the extension activities with the help of Training and Visit Scheme, Extension Education Unit, Krishi Vigyan Kendras, and Agricultural Technology Information Center. Since 2003 the offices of the Extension Agronomists under T & V System were strengthened and four Regional Agril. Extension Education Centre (RAEECs) were established at Parbhani, Aurangabad, Ambajogai and Latur. In order to support the extension agency with technical competence and to undertake ideal extension education endeavors, the Directorate has been strengthened by horizontal expansion. Four RAEECs have been established at Parbhani, Aurangabad, Ambajogai and Latur. The Extension Agronomists and the resource scientists organize visits to the farmers field, diagnose the problems and provide solution for the same. The specialized short and long durational trainings have been organized on a massive scale for the staff of the State Department of Agriculture and other developmental departments as well as for farmers, farmwomen and youths. The need-based trainings have been conducted on the subjects like, IPM, INM, horticulture, sericulture, vermicomposting, animal husbandry and dairying, post-harvest technology, food processing, export-oriented production, mushroom production etc. The university has given vital technical support to the State Department of Agriculture through conducting monthly district workshops on regular basis in each district of Marathwada. 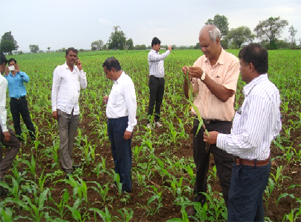 University Scientists from different Extension Centres, Colleges, Research Stations and Schemes regularly visits to the farmers fields. They solve the field problems of the farmers on the spot during these visits by assessing the crop condition in the field. 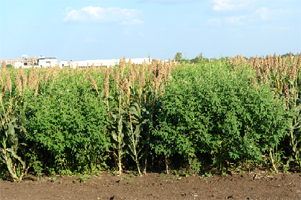 The University has demonstrated maximum genetic production potential of major crops in the field conditions through front line demonstrations throughout Marathwada region . These activities created awareness among the farmers about new varieties and trained them with modern technological packages of practices recommended by the University. This activity also provided an opportunity to the University Scientists to demonstrate the validity and relevance of their experimental findings. The observations made by the scientists during visits to the demonstration plots are used as feedback for planning future programmes. These demonstrations encouraged the farmers in adopting latest technologies and thereby increased their farm productivity. 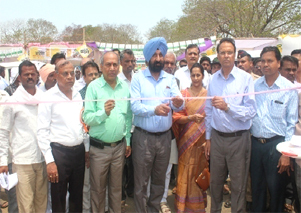 University organizes exhibitions on the eve of Kharif farmers Rally, Rabi farmers Rally and Women Rally on 18th May, 17th September and 3rd January every year respectively. The exhibitions were also organized on the eve seminars and workshops. Besides the University, SDA and other line Departments, Fertilizer, Seed , Pesticide companies , NGOs and SHGs were participated in these exhibitions and showcase their technologies and products and Bi-products. The Directorate of Extension Education publishes three extension publications every year namely Agricultural Diary, Farm Magazine and Calendar on regular basis. The Directorate of Extension Education also published various publications containing information on crop production technologies. More than two dozen publications are available at present having current interest to the farmers. For easy access and communication Telephone Help Lines have been started at ATIC, Parbhani, KVK Aurangabad and RAEEC Latur. The novel idea of establishing telephone help-lines is for answering the queries of farmers and entrepreneurs. These facilities helped a big mass of farmers. 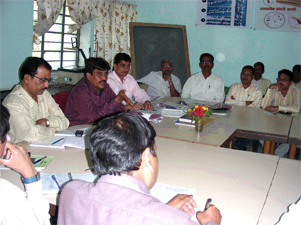 SMS facility for the farmers is in operation from January 2011 at ATIC, Parbhani. Messages on the modern agricultural technologies and solutions to the problems faced by the farmers were given on the Mobile. 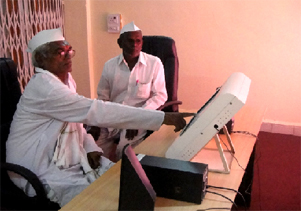 Touch Screen facility for the benefit of farming community is available at Agricultural Technology Information Centre, Parbhani. Information on agriculture and allied fields is available to the farmers by simply touching the screen. 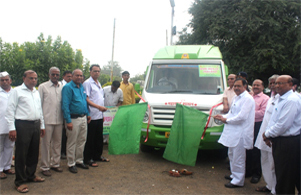 The university has reached the doorsteps of the farmers in real terms by the way of mobile crop polyclinic wherein the facilities are available for diagnosis of pest and diseases. Project entitled "Transfer of Integrated crop management Technologies developed by VNMKV, Parbhani" under Rashtriya Krishi Vikas Yojana (RKVY) is in operation since Rabi 2011. Budget outlay of the project was Rs.575 lakh (Rupees Five hundred seventy five lakhs only) for the period of three years i.e. 2011-12 to 2013-14. The same project was continued for the year 2014-15. The New TOT project with similar objectives was sanctioned for the period of next three years (2015-16 to 2017-18) with budget out lay of Rs. 460.00 lakhs. Under this project demonstrations were conducted on the farmers’ field through cluster approach and recommended technologies were demonstrated on farmer’s field. 1000 to 1200 demonstration on important crops of the region are organized during every season. Various extension programmes and exposure visits are also organized for benefit of farmers. The results of project helped in increasing knowledge and skill of the farmers and increased adoption of university technologies by the farmers. The beneficiaries were further disseminated university technologies to other farmers. Efforts made through RKVY extension programmes also resulted in to multiplier effect reaching the demonstrated technologies in vicinity. Innovative Extension Campaign "Vidyapeeth Apalya Dari, Tantradnyan Shetawari"
Special extension campaign "Vidyapeeth Apalya Dari, Tantradnyan Shetawari" was launched by university and is in operation since last five year. The campaign was launched with the objective to educate farmers on crop production technology, to boost up the productivity of different crops specially pulses and oilseeds, to solve the problems of farmers on the spot and to generate hope among farmers. Under this programme a team of experienced scientists visited villages as per the pre-decided schedule. 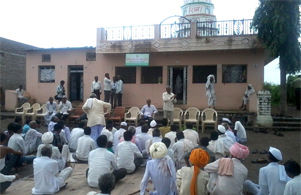 The farmers appreciated the programme for its direct utility to them. The responsibility of launching the progrmme was shouldered to ATIC Manager and Extension Agronomists with the involvement of experts from different Colleges and Research Stations. 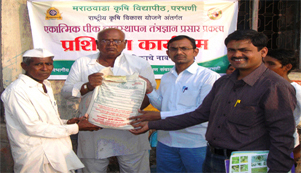 "UMED" - A programme to prevent farmers suicides in Marathwada region. Due to continuous natural calamities like drought, heavy rains and hailstorms, farmers in Marathwada have been loosing crops in the last five years. Number of farmers have been committing suicide in all the eight districts of the region. In order to avoid the farmers suicide and to encourage the farmers not to take such extreme step and to give moral support, VNMKV has launched an innovative programme “UMED” since December, 2014. 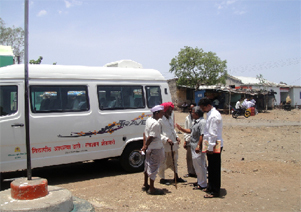 The University scientists visited villages and with the help of school students organized “Prabhat Pheri”. 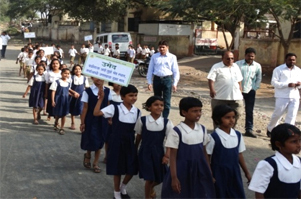 The school students marched through streets holding placards in Prabhat Pheri which give courage and reassurance to the farmers and giving a hope in future. Scientists diagnosed location specific problems of farmers and recommended to adopt low cost, risk minimizing technologies developed by the university for sustainable farming. Under this programme more than 400 villages were covered from 76 talukas of the region till to date. H.E. Shri. 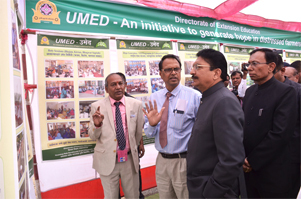 C. Vidyasagar Rao, Governor, Maharashtra State during his visit to university and Osmanabad district appreciated the programme. The university is implementing CROPSAP and Hort-SAP Projects for monitoring the pest incidence on major crops of the region in order to avoid the outbreak of pest. Similarly management advice is also given twice in a week for each taluka. The programme has appreciated by the farmers. This is an unique ICT based programme involving different government agencies. The project has received e-Governance award at national level. State Department of Agriculture, Government of Maharashtra organized special campaign "Unnat Sheti Samrudh Shetakari" during 25th May to 8th June,2017 with the objective to increase the farm production. University constituted teams of scientists at block level for providing training and technical guidance to the farmers and extension workers. District & Divisional level committees monitored the whole campaign. State Department of Agriculture, Government of Maharashtra also organized "Krishi Jagruti Sapthah" during 1st July to 7th july every yearon the eve of Krishi Din. University scientists organized various extension activities in coordination with the State Department of Agriculture during the week. The various programmes implemented by Directorate of Extension have helped in disseminating the knowledge of recent technologies/recommendations given by the university scientists to farmers for adoption. The results are more prominent in the adoption of improved varieties and other management technologies in general in most of the crops. The trainings/workshops, farmers rallies, arranged to different beneficiaries has also helped in disseminating the new technologies up to the farmers. In general the extension work helped in the adoption of IPM, INP & increasing production and productivity in many crops particularly pulses, oilseeds and cereals. The socio-economic status of farming community of the region is improved to a greater extent due to continuous extension efforts under taken by the University.